Earn $24.90 in Rewards credit (2490 points) What's This? 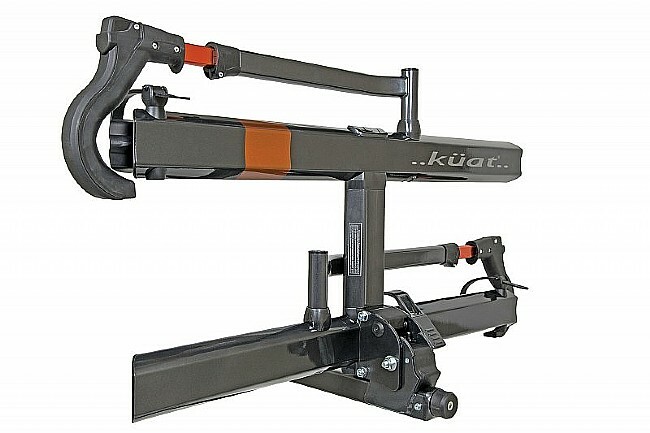 The Kuat Sherpa 2.0 Hitch Rack does all the hauling, so when you get the trailhead all you have to do is ride. This updated version is more convenient than ever thanks to its folding front-tire cradles that create more space between the rack and the vehicle when in the upright position, and a foot-operated tilting mechanism lets you get into your tailgate without reaching down low. The no-tool design uses a hand-tightened hitch cam system for hassle-free installation, and since it only weighs 32 lbs, you don't have to round up all your buddies just to get the thing on and off. 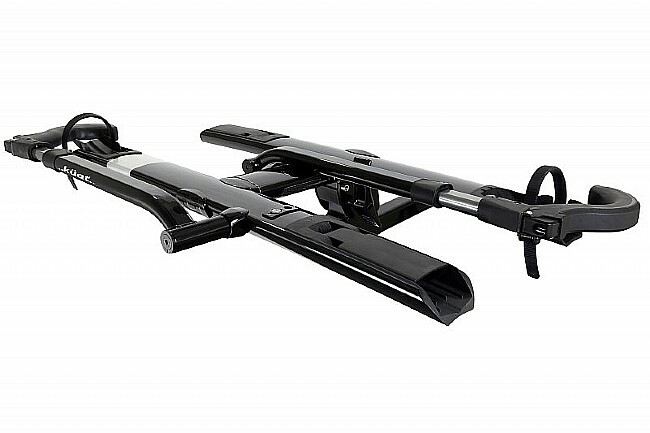 Your bikes are quickly and safely secured with a co-molded rear-tire strap that protects paint. Out front, an intuitive ratcheting cradle holds tightly without requiring any elbow grease to release it. You can even walk away from your car - bikes still on the rack - with some peace of mind thanks to a sturdy cable that wraps around your bikes and locks into the rack. 2 bike capacity, up to 40 lbs each. Fits wheelbases up to 47" and tires up to 3" wide. Includes locking cable and keys. This is a terrific rack. I was easy to assemble and even easier to use. The rack is especially easy to mount on my car's hitch. It's also relatively light (32 lbs.) so I have no trouble getting it from the garage on to my car's hitch even though I am 70 years old and not nearly as strong as I once was. I can get my bike on or off the rack in less than 30 seconds and, when mounted, my bike is safe and secure. I especially like the fact that nothing touches my bike's frame. In sum, I am more than satisfied with this rack and I would recommend it to anyone who seeks a safe, secure and lightweight hitch rack. In theory the build it in the box sounded like a great idea. The one I received however had a major flow in one small piece which made it impossible to instal in box. It required me to mount it to the hitch and then loosen every bolt so I could install the tray rods and subsequent back plate. 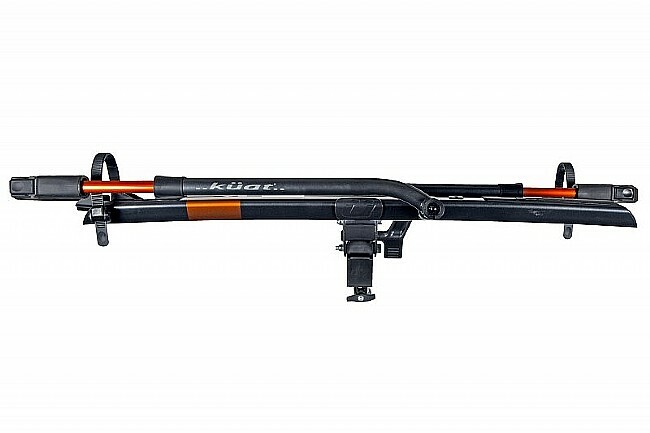 The product its self is easy to use for the most part, secures the bike snuggly and is very sleek, slim and lighter then the Thule. However, if it wasn't for the astronomical return fee I would have returned it and purchased another Thule XTR. Best carrier in the market. We are happy to say we have the best carrier so far, easy and quick assembly. 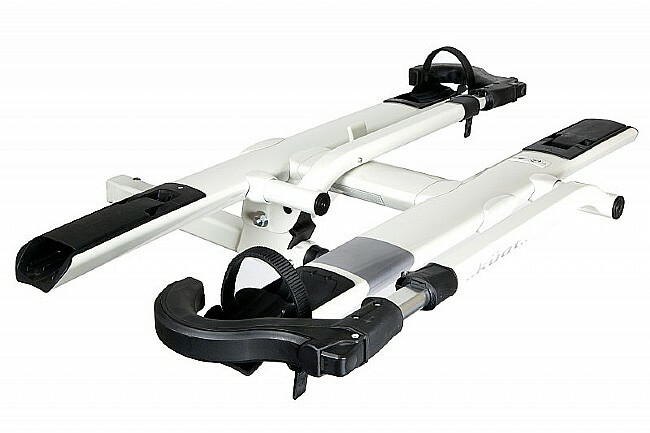 For us most of all it was important to have a light weight yet Sturdy carrier, with tilt options that secured to the hitch without moving or bouncing while driving. Kat is a Home run in every aspect, highly recommended! Looks great. Sturdy, solid rack. Holds my full suspension 29er perfectly. Even holds my son's 24 MTB without the adapter. Not sure how secure the included lock is? I will be using an additional cable lock if my bike(s) will be unattended for an extended period. Wanted something more compact and lighter than my old swing-away style. This fits the bill. Assembly was easy (I'm mechanically inclinedexperienced.) I could understand someone finding it challenging. I used a rubber mallet to engage the pieces prior to bolting home. Carried the bikes 'tween central Oregon and SOCAL just fine. The price point may seem a bit ridiculous. However, if you can foot the bill, the product is of such high quality, that the purchase is worthwhile. The rack is sturdy and easy to install (although you do need a torque wrench), and makes me feel very secure about my bikes. Road racers to wide tire niners fit with no problem, and the lock features are great. If someone needs a long-term bike transport system, this is the answer. I love this thing. Not the easiest to put together, but certainly not the most difficult either. Once it's built, it is sturdy, lightweight and does not flop around at all once tightened into place. Also, loading and unloading bikes could not be easier, I've used with my 29er, CX and road bike with no problems. positives Looks good, installs without tools, easy to raise and lower with the bikes so you have access to the hatchback, lighter than most, bikes are held securely, locking features. negatives Cost, it's still heavier than I'd like.